maya*made: Salley Mavor and a give-away! Salley Mavor and a give-away! Blogging has the potential to be quite powerful and something amazing happened this week. A doorway opened. In my last post, I shared with you my love for Salley Mavor's book Felt Wee Folk. First, a little background is in order for you to fully appreciate my gushing... oh and do read through, as there is a surprise at the end! My admiration for Salley's soft 3 dimensional illustrations began when my son was a toddler and we stumbled upon her rendition of Mary Had A Little Lamb . Having grown up in a nursery school with constant exposure to wonderful books, I've had a lifetime love affair with children's literature. Salley's Mavor's exquisite tiny details moved me more than any other book before. I remember bringing it home and staying up late into the night pouring over every little tiny stitch and wishing I could jump into the page. I was hungry for more and discovered that she had created quite a few books. They were each gorgeous, but the text of In the Heart (Ann Turner) combined with Salley's evocative felt sculptures took my breath away. When her how-to book (Felt Wee Folk ) was released, I felt like I had struck gold. This was long before my days online, and it remained one of my only crafting books for many years. When I shared it with you on Monday, I didn't do my usual Googling for background. It simply didn't occur to me, since I associated Salley Mavor with a different time in my life, the pre-blogging era. However, a bit of "virtual" magic occurred yesterday. Maybe some of you noticed. Salley Mavor commented. Not such a big deal? Oh my, how it rocked my world! Yes, of course Salley is just another talented artist in this inspirational on-line community... but not only did I not know she was HERE... she's has been a house hold hero of mythic proportions for years! 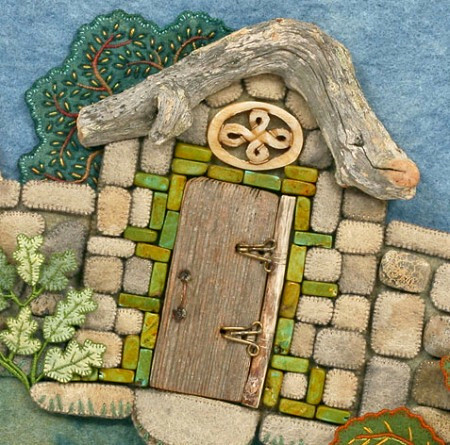 So, please let me introduce (and do forgive me if you already know this)... Salley's blog: Wee Folk Studio. I have been a bit lost there for the last 24 hours... I did feed my family and do the laundry... but all with a glazed look in my eyes. Her blog is filled with wonderful insight into her creative process and I ate it all up. It's my new must read! Her latest book is quite the masterpiece: A Pocketful Of Posies combines her original fabric relief illustrations with a treasury of familiar nursery rhymes. Every image in this post comes from somewhere in between the pages of this lovely children's book, soon to be a classic. I've now had some very nice correspondence with Salley, and she's just as kind as her work is lovely. She is offering an autographed copy of Pocket Full of Posies to one lucky reader! What a wonderful addition to any library! Please leave a comment in this post before Saturday at 5pm EST and the random winner will be announced on Sunday morning. Good luck! Comments are now closed. Thanks! That is some gorgeous work! It's a feast for the eyes. Thank you for sharing. This is such a generous offer! I have seen and admired her work and would love a signed copy of her latest book. What a wonderful give away. I'm astonished with her work. So wonderful and delicate. It's all so enchanting! What a wonderful, talented artist. Thank you for sharing this!! wonderfully inspiring work! I am so grateful for the opportunity to win a copy of the book! WHat a perfect craftsmanship and really I really held my breath while reading her blog which link's given on this post. I probably can't believe it (at first) if I could win this! What a treat! I have long loved Salley's work! Thanks for the opportunity to own a bit of it. Amazing work! What a beautiful book! Thank you for sharing and thanks to Salley for the generous give away. Love, love, love Salley Mavor! One of the most inspirational illustrators and fibre artists I've ever found. Winning a copy of her gorgeous new book would be an honor. When our son was small (he's 15 now! 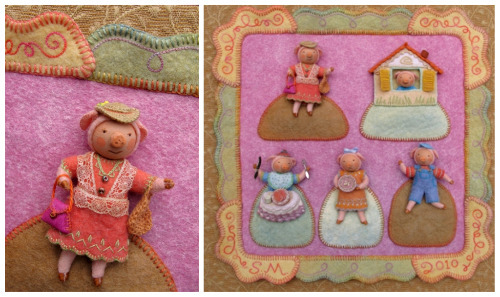 ), I made many wee felt folks from Ms Mavor's first book. When our daughter was a baby (she's nearly 6! ), we bought all of Ms Mavor's board books and gave the set as gifts many times over since. Now I'm so happy to hear that there is another of her creations in print and know that I will have one. It would be lovely to win a giveaway, but will eventually purchase for myself, maybe to sneak into my Christmas stocking... Thank you! Oh wow! I can't even begin to imagine the work that went into this book. What an amazing artist! Oh my! The incredible creativity, time and talent that go into her work is amazing! This book would be a treasure for young and old alike! such a talent! beautiful images. what a wonderful giveaway chance. thank you! what a beautiful treasure! thank you for introducing me to this artist and her beautiful book. I came across her blog about a month ago and was blown away by the work. It is beautiful and if I had the book I would gaze for hours at the details. I would love, love, love this book. I would love to win a signed copy. I love the 3-D aspect of her work. What stunning work! I love love love the details! I really hope I win! I think my little Sammy would love it! How sweet. I imagine parents might want to stare at the pictures longer than their kids. Would LOVE to have this book! What a wonderful post! how exciting for you! Her work is amazing! I would be overjoyed to own a copy! Her work is amazing, I've been following her blog for a bit now and I can't wait to get my own copy of this book (which I will get one way or another!). Oooh, I've been a fan of her work, and I'd LOVE to have this book. My young daughters (learning stitches) would adore it also. I imagine it would inspire many more little stitchers...and their mothers! oh my gosh, what I didn't realize until just now when I went to go look at her blog and website is that she lives in my area! We recently moved here and I had no idea she was so close, and I can go see her exhibit! And I just missed the tour she gave through her exhibit YESTERDAY! How wonderful!! How beautiful. Thank you for this amazing opportunity but for also introducing me to Salley Mavor's work. What a fantastic surprise! I can't wait to check out her blog. My daughter would love this book. Oh how sweet! I can imagine you must have been blown away reading her comment! What a detailed work she makes! Simply wonderful! What an awesome book. Please enter me. gasp! her work is so moving. and the internet can be so awesome - how cool that you two could connect like this! Oh my , reading your post was like reading my own story. I also stumbled across her board book version of wee willie winkie when my daughter was a toddler. I also have her book on creating felt scenes and it would just be such a blessing to have this beautiful book from salley mavor (signed!!!) WOW! We love Felt Wee Folk, and this new book looks absolutely amazing. What a great giveaway! 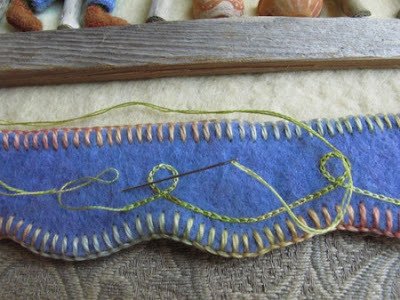 Yes, I love her beautiful and precise stitching. What a great book and lovely post. we too have lots of sally's folk tucked around our house - she too is my hero! thanks for the lovely post! I'm heading over to her blog right now! Her works looks very familiar and I'm pretty sure we've picked up some of her books to read at the library. Ms. Mavor's work is so beautiful. Thanks for the giveaway. I'm nearly overwhelmed with admiration (and inspiration!). After reading your post yesterday, I ordered a copy of Wee Felt Folk for my kids and I to savor. Thanks Sally and Maya for a chance to win another of these beautiful books! After your kind response to my questions about "Wee Folk" I went right to Amazon and tucked the book into my Wish List. 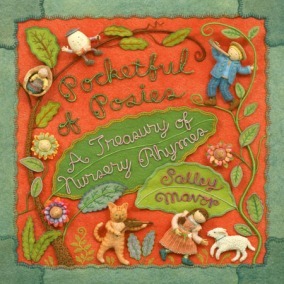 Then I came back here and saw Salley's comment about her new book, "Pocketful of Posies" and I went back and put that book into my Wish List too. My 2 yr. old grandgirl will LOVE it for Christmas (and so will I). I'm excited to go visiting Salley's blog. 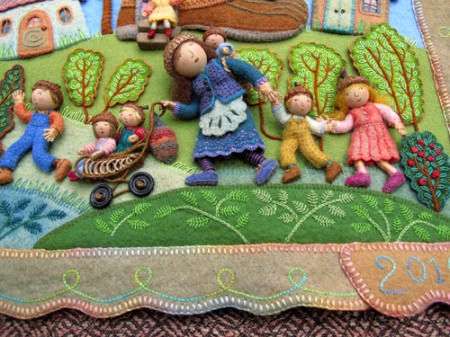 I adore her work and would love to embroider some projects using her pictures as inspiration. I'm so glad you two found each other and shared it with all of us. wow! I too found her little board book years ago and savored the details! would love this for my wee ones! Thank you for introducing her to me. L.O.V.E. Oh, Maya! How incredible!! Both Sally's exquisite work and your experience of having one of your heroes see your post and comment! I can't imagine the thrill. I will get my hands on these books for sure. Thanks for the introduction! what fun for you!!! and us!!! isn't that the most exciting thing to know that one of your most admired authors/artists reads your blog and has one too!! the nicest people always meet. i'm so pleased for you, and for the opportunity to enter this giveaway...now, on to her blog! Oh. Breath-taking. My kids would LOVE this. Thank you for introducing Sally - I've never seen her work before and it is truly enchanting. Oh my, I'm lost in amazement. I would love to win so wonderful book! I cant take my eyes of her fabric illustrations. I have never seen something like this before! Wow! Thank you for introducing me to this amazing artist... I just got lost on her blog, and will have to look at it later (after my wee wonderfuls have gone to bed!) I can't believe the perfection of her tiny stitching. So amazing! don't you just love blogland? full of amazing generous talented people? What a beautiful, fun book this would be to win. My 2 and 5 year old boys would love it. Thanks so much! These are so breathtaking. I would be so honored to have that book for our library. Even if we don't win, thank you for sharing the gift of the wonderful artist. This is the first time I am seeing her work. How wonderful! I am a lover of children's literature as well and would love to add this to our family library! How wonderful! I would love to add this book to my baby girl's library. Thank you for sharing. My two girls and I would love to learn to make this kind of art! What an amazing artist, I'm sure my children would love this...after I had finished with it. It looks gorgeous. Thank you for the introduction. spectacular book! i've got a ring around the rosey loving girl that would enjoy this book. This book is sooo beautiful !! My kids would love it !! How fabulous! I would love to own that book! I would love to win this book. I have seen her work before, but didn't know she had a blog! Thanks so much for sharing!!!! oh my goodness! thank you for posting this - her show is coming to our area next spring. her stuff is so lovely and i would have never known it was going to be on exhibit here - thank you again! and what a generous giveaway. It would be wonderful to have this book and autographed too!!! oh my , her work is absolutely amazing, what she can do with felt and thread! How fabulous! She must have been thrilled to see your absolutely unsolicited enthusiasm for her work. I'm glad to know about the new book! Oh, what a gorgeous book! What an absolutely beautiful book! I would love to share this with my grandchildren. How wonderful! The world is not as big as we think, sometimes. And this is a delightful book. What a beautiful book. Who wouldn't love it! I would love to have this gift!! Thanks for the opportunity and the introduction to her work! My children and I are glad to give it a try! Wow, awestruck, the level of work and detail - just gorgeous! what a lovely giveaway! salley's work is amazing and so creative. Amazing! She's an incredible artist; the book is adorable. Please count me in, thanks! This is too exciting. What a great book AND so inspiring! I'd love to read this book with my little guy, it's beautiful! The details are amazing. Those pigs! That roof. All those leaves! I love every single tiny detail. what an amazing treasure! breathtaking. We would love this!!!! Thanks! Oh my goodness so beautiful. I'm heading to her site now. Thanks for sharing. Thank you for a chance to win the book. Salley's work is amazing and I am glad to have been introduced to it through this blog. thank you for sharing, her work is amazing, so much detail, I can't imagine how much time she spends creating each masterpiece. What a wonderful opportunity!! THANKS! I've also been a fan of her work for years & am planning a trip from the west coast to the east next month & am hoping to convince my sister to take me to her exhibit! I own the Wee Folk book and have enjoyed it enormously. Her talent is endless. My daughter and I have had so much fun, making our own wee folk! Such craftmanship and detail. I love it. Thanks for posting about it. Her work is gorgeous! I'm so inspired by her embroidery. Thanks for the introduction to her work and for the giveaway. oh goodness! what a gorgeous book!! thank you so much for introducing me to her blog. i would be beyond thrilled if we happened to win! what divine work she creates! I would love to go into the draw to win a copy! Oh my! I think it's LURRRRVE! XXxx. I've had the pleasure of seeing the pages of her book in person, yesterday, in fact. They are on display in Falmouth, MA and are so amazing to see up close. She is quite sweet as well. Just amazing! Thank you for introducing us to her beautiful work. I'd love to pore over those tiny stitches. What a great blogging story- very cool that she read your blog and left a comment! I am amazed by the detail in the work she does- wow. Thank you for your generous give away! You aren't kidding her work is just magnificent. So intricate and beautiful. I want one. Oh, how happy my kids (and me) would be to win her book. We discovered In the Heart at our library many years ago. Her work is just wonderful! 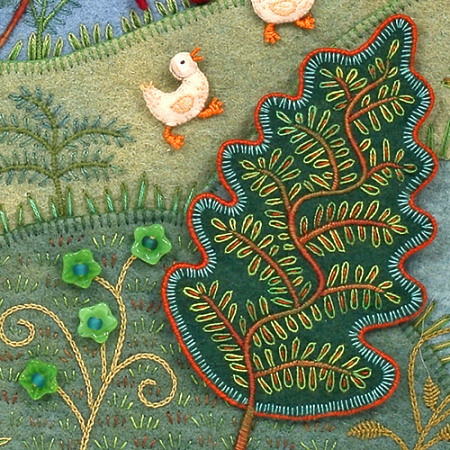 Embroidery is one of my most favorite kinds of handwork, and she is so very inspiring. Thanks for the great giveaway offer! My little one just turned two at the end of August and she is blossoming in the world of imaginative play. She has little animals, but a few wee folk would be a wonderful addition to her world. ohhh what a beautiful book! I'd love to be able to share that at our art studio!! What a fun discovery for you. Her artwork is really breath taking. I am off to visit her blog. WOW, her work is outstanding and so unique! How I would love to win a copy, thanks for the giveaway. Lovely books. I hope I win. wow thank you so much for sharing this amazing work. Thanks for sharing her work. It's lovely, I am now on the hunt to see more of her work! Thanks, can't wait to share with my own kids. I am so thankful you have introduced me to this amazing and inspiring work by Salley. I am gobsmacked.... if I don;t win I will be purchasing her books for Christmas presents for myself!!!!! 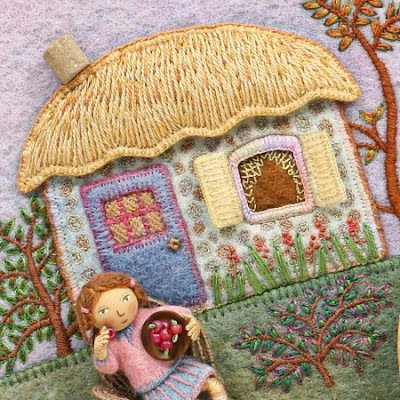 Her stitched illustrations are wonderful! Thanks for introducing us to such a talented lady, and what a neat coincidence that she posted on your blog. Love it! Oh my. This book looks absolutely fabulous. Not only are we huge fans of books in our home, but of handmade love as well. It is all in the details that the richness of life can be found. Oh what a darling and inspiring giveaway. To be in contact with an admired author-artist. I wish everyone good luck, but I'd sure love to win this book to share with my baby girl. She becomes so excited when we read. Thank you for the opportunity. SO DARLING! I love it. I usually look at things and think "I could make that" (as most crafters do) ;) but THAT!!! I could never do that. so beautiful. I would love to have a copy for my girls...to be their favorite and wonderous memories of. thank you for sharing! I've been a fan of Sally's work for years, too! She's pure magic. you must have been so excited to get a comment from someone you admire so much! and what a beautiful giveaway. i would probably take myself on a date to give the book the proper attention if i won. thank you!!! This book made my heart sing. What a lovely way to share the beauty of reading. LOVE. I love the details in the pictures, and we all love nursery rhymes, here! I love it! Just another example of how interconnected the world is. That is just amazing. I would love to win, and even more, I would love to have that talent! what a delightful story! Our family would treasure this treat! Her work is magic. I stumbled upon Felt Wee Folk a few years ago while at the library. I find you immediately fall into a sort of trance when going through the book. Such talent takes you in a different world. This is such a great give-away, and I think the volume of comments, well, speaks volumes!!!!! I would truly love to win tis, and even if I don't, I'll be ordering t in the next few days- thank you Maya and Salley!! Such beautiful and inspiring work! Thank you for the opportunity. Oh it looks so very beautiful :) I loved the story of how the giveaway came about. That is so cool that Sally reads your blog!!!!!!!!!!! she must have been thinking "that is so cool that she has my book and uses it :)". Thanks for introducing me to such a talented artist! I have Felt Wee Folk on hold at the library. Thanks for the giveaway. this is unbelievable~ what beautiful art! What a beautifull books! It's almost magic! I live in the Netherlands and do not know the childrenbooks of Salley Mavor, so I think it's time we meet her here!!! Love all of Salley's work and yours! Oh, thank you so much for introducing us to Salley's work. I LOVE it! We're big fans of felting, and now we'll have to experiment with making pictures, too! It might have to wait a bit, my 7 year-old just broke her arm (yes, I'm going for the pity vote here- a mom with no shame;) but in the meantime, it would be such a treat to share Salley's nursery rhyme book with her. Zoe would love it! What serendipity! And what a lovely book. Thanks for the opportunity. Oh please! what a wonderful work! I never see something so beautiful. Wow - that is one gorgeous book, and I have a little cousin who would be thrilled with it. Thanks for the chance to win! I would love to sit on my comfy couch and read this with my 4yr old. Giggles and Aaaahs for sure. Felt Wee Folk was the first crafting book I ever bought and I bought it because of the photographs of her work. I'm excited to hear that she has illustrated books. What a wonderful giveaway, I'll be keeping my fingers crossed. I do love her art and would be so happy to win a copy of her book! So gorgeous! Thankyou for posting about Salley, I'm always on the lookout for beautiful and interesting books for my little one. I especially love how she incorporates beads and hooks in her pieces. Really??? That's awesome, I'd love to win this sweet book! What wonderful inspiration. Can't wait to check out Salley's blog. I have never seen any book so beautifully made. Any child or even adult would be lucky to have this...I could see it become a family heirloom. Crossing fingers and toes to win. I went to her site immediately, my goodness so cute and so soft and so emotional. Did you see her folk doll collection..... Thanks for the link. And of course I should be honored to win this beautiful book!!!! On my blog is also a giveaway....you are welcome! Whoever wins will be happy happy happy. I want to be happy happy happy. 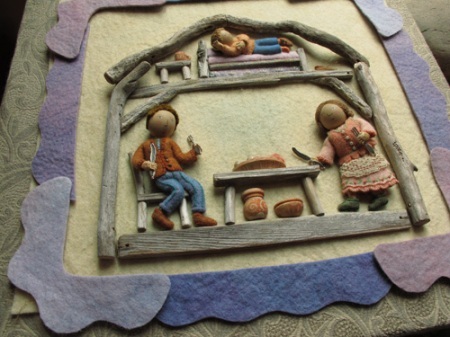 Felt Wee Folk has been a favorite in our house for a number of years now and I can't get enough of Salley Mavor's work. Thank you for introducing me to her gorgeous blog and please enter me in the giveaway! My twin nieces would ADORE this!! I love Sally's work. She is amazing. My children (and I) would love this! Thanks for the chance! It is a small world! Thank you ! This book looks like a treasure. We too have admired the 'Wee Folks' book for the past few years. The details are amazing!!!!! Thank you so much for such a generous giveaway! Wow, what amazing artwork! I would love to win! oh, let it be me, let it be me...my little ones would love this. Well...what a nice way to perk up my rainy, cough-and-cold-infested afternoon!!! I'm going to make a cup of tea and check out the blog, too! Ofcourse we would love to win such a wonderful book! Her work has always inspired me - what a wonderful giveaway. I have never seen her work before. It is amazing! I would love to own a copy of any of her books! Found you through "Crafting a green world". Love your blog (& am now subscribed) and love this post. As a first time grandma soon, this is exactly the kind of book I am hoping to share with the wee one. I really love her work too! I'm off to find it through the library, but would love to join the drawing. Thanks. PS We have another book from the library with beautiful fabric and embroidery pictures that is worth taking a look at. It is Snow White and the Seven Dwarfs adapted by Joan Aiken and illustrated by Belinda Downes. I'm sure you will love it almost as much as Sally Mavor's works. Wow, what a wonderful style she has! The book looks awesome! This is a very special and wonderful world that I would love to visit! 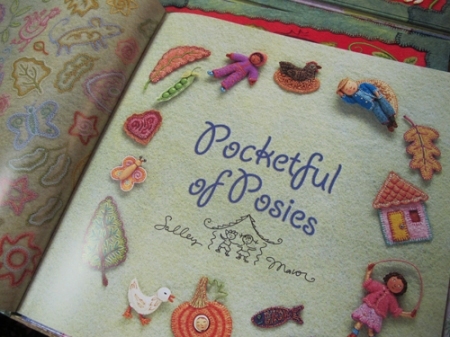 Thank you for featuring Salley Mavor - Pocketful of Posies has to be one of the most beautiful and enchanted books I have ever seen. I am filled with inspiration and awe. I shall be a regular reader of Salley's blog now, so thank you. The texture and colour in those pages is beautiful. We would love to win. Thank you for the giveaway. My goodness that is amazing work. What talent !!!!! This is a very lovely and generous giveaway. These are extraordinary, and yes would love to win. Just lovely, and the colors! wow! and who is to resist to this beautiful piece of art!?!?! Thank you! Would love to have this beautiful book! Oh my goodness.....I just couldn't stop looking at the pictures you shared.....the needlework is absolutely amazing and a feast for the eyes! So beautiful and what a great giveaway to offer! Oh, I love, love, love it! Thanks for the chance! Wow! What amazing art she creates! 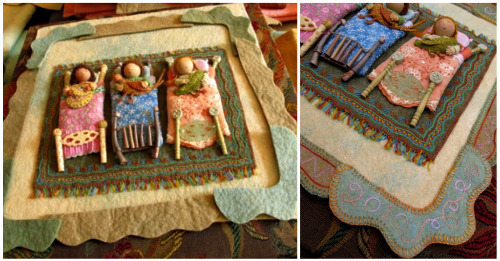 I am inspired to make my own felt pictures, and would love to have such a beautiful book to read to my kids. Oh, Wow! What an honor to have such an amazing artist comment on your blog! The pictures are incredible. Thank you so much for the giveaway.